Explorez les traditions gastronomiques distinctives de Bologne avec une visite gastronomique d'une journée complète en train au départ de Florence. 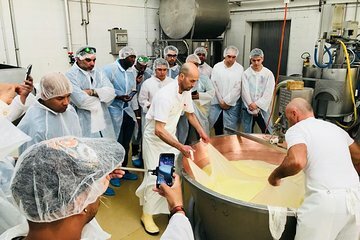 Découvrez comment le Parmigiano Reggiano passe du lait frais de la ferme aux vieilles roues et dégustez des fromages aux côtés de Lambrusco d'Émilie-Romagne. Rencontrez une famille qui produit des générations de vinaigre balsamique vieilli en fût de chêne, puis appréciez une série de jumelages avec différents millésimes. Goûtez le prosciutto de fabrication artisanale, voyez comment il est fabriqué et installez-vous pour un déjeuner de plusieurs plats à l'italienne accompagné de vins locaux avant de rentrer à Florence. Well worth the early morning start to watch them make Parmigiano Reggiano cheese ... and then we were served breakfast tasting cheese and wine. Our friendly guide Alessandro was very knowledgeable and energetic. Then we proceeded to a small family run Balsamic operation. Our next stop was to see the manufacturing of Prosciutto. We ended the tour with a fantastic multi-course pasta tasting lunch ... the owner heard I liked gnocchi and also pappardelle, so she went back to the kitchen and brought out more dishes for us to try ... AMAZING food!!! The tour was very interesting, we came away having learned a lot about how local delicacies are made with great passion and care. Wow. This was the most amazing tour. A must do for everyone in the area. Our guide Alessandro was the amazing! The parm factory was very cool to see the process and then be able to try cheese that was up to 3 years old. The balsamic tour was prob my favorite. A small family owed factory and the product was better than anything I've ever tried. The prosciutto factory was unreal. I never could have imaged how huge this place could have been. It was almost overwhelming how much meat there was. The true highlight of the whole day was lunch though. I can't even begin to explain how much food there was and how incredible it all was. This tour is not to be missed! Had the most wonderful time, our guide was amazingly adorable and knowledgeable. My only draw back was dinner went so long that we almost missed our train home. .. but the food was fabulous, would definitely recommend to everyone! Excellent day! Our guide, Eleanora, and driver, Marco, were great! More than we could have hoped for. Fully recommend. Educational tours, wonderful lunch, exceptional day. Just can't say enough about how great this tour is! Our guide Alessandro is quite the character! From the breakfast at the cheese factory to a never to be forgotten luncheon at the estate it an experience not to be missed! We had a wonderful day on this well organized, highly informative tour. Allessandro, our guide, was well versed in the procedures for making parmesan, proscuitto, and balsamic. He is engaging and high energy. A driver met us at the train station arranged by the tour from Florence and joined the group at the first stop, the Parmesean factory. From there vans took us to the other stops and finally to a winery for lunch and wine tasting. The food, wine and surroundings were amazing! Each course came with at least two wind pairings. Alessandro and his wife were delightful. I would love to do another tour with them! This tour was completely amazing! Fabio our guide was so knowledgeable and of course hilarious! Toured the Parmigiano, Prosciutto, Balsamic Vinegar Factory and of course we had a beautiful family style lunch in the countryside where Fabio kept on pouring us wine non stop! You have to book this tour!